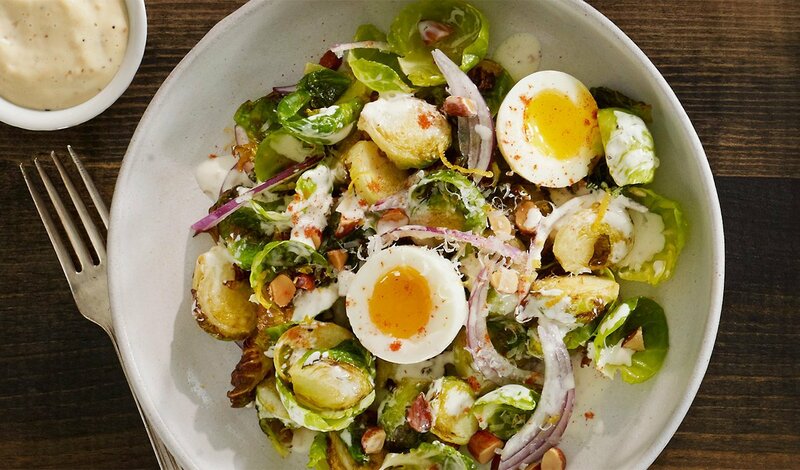 Caramelized Brussels sprout halves are tossed with shaved red onion, smoked almonds and lemon zest. Finished with a drizzle of Caesar dressing combined with liquid smoke and topped with a soft boiled egg. Combine ingredients and stir until well incorporated. When Brussels sprouts are fresh from the fryer, lightly dust in granulated garlic and smoked salt. Toss fried Brussels sprouts with remaining ingredients.